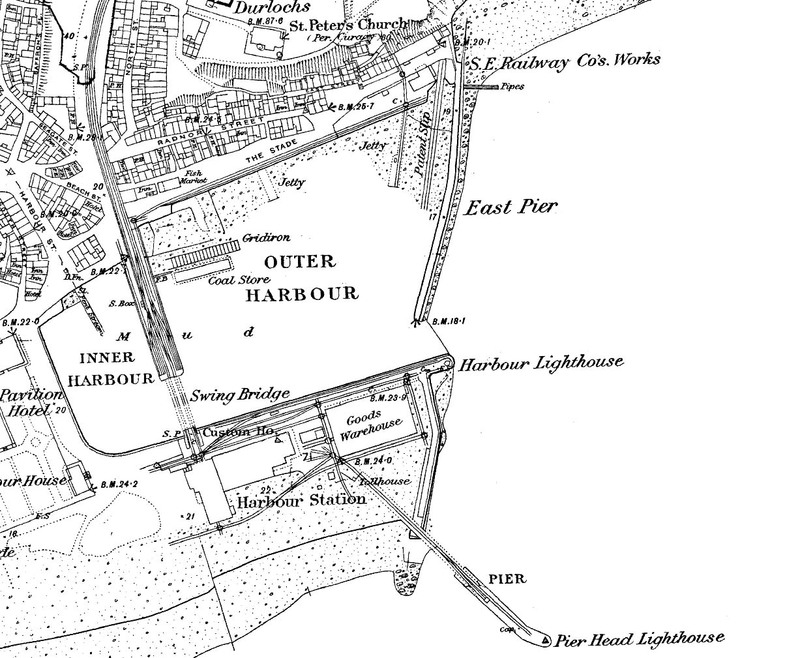 1873 1:2,500 OS map shows the layout of the harbour and station. The harbour is formed from three piers: the West Pier, which is in front of the Pavilion Hotel; the South Pier in front of the station; and the East Pier. The fourth south-east-facing pier is a later addition; this was built in 1861 to counter problems caused when larger steamers were berthing at low tide inside the harbour. By this time it was rail-served but could not yet be reached by passenger trains as the only rail access required the use of wagon turntables. The large goods warehouse, encircled by sidings, is to the east of the station. The viaduct and swing bridge separate the inner and outer harbour. There are two tracks running across the viaduct flanked by a further two tracks supported on timber piers. Before the Harbour station opened in 1850 the viaduct was the terminus of the line and also acted as a coal jetty; a coal store is seen to the east. There is a signal box on the west side of the viaduct. The South Eastern Railway had a works at the north end of the East Pier reached by a siding running alongside The Stade.